At the community meeting each August, the prioress provides a reflection that gives the sisters something to think about and ponder for the upcoming year. On August 5, Sister Nicole Kunze asked the sisters to consider the question, “What can we create together?” She encouraged them to reflect on the challenges faced by our Benedictine foremothers as we face the challenges of our time. These challenges will require us to think creatively and take some risks, but we will do it together. 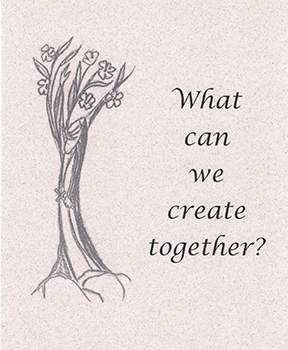 Each sister received a card with an image drawn by Sister Edith Selzer (deceased). The image portrays Mother Benedicta Riepp’s dream of a tree covered with white blossoms, symbolizing the flowering of Benedictine life in the US. Mother Benedicta is one of the first Benedictine sisters to come to the US from St. Walburg’s Abbey in Eichstatt, Germany. Sister Nicole will be visiting the abbey next week as part of a pilgrimage with the University of Mary health sciences faculty.